A grand and inviting façade fronts a purely functional and practical gambling experience at Grand Parker Casino. The bonuses are definitely not bad though. It's always a good idea to get a no deposit bonus when trying a new provider. To benefit from a Grand Parker Casino Bonus without depositing you can use the exclusive coupon code 20GRAT. This gets you 20 free chips to kick off your gaming experience at no risk. Of course the organizers want you to deposit and to incentivize you to do so there is a further bonus promo voucher, which will get you 250% on each of your first two deposits. The code for this reward is available on the provider's web site as are numerous other deposit match voucher codes. If you're less into the slots and more of a table game fan, there's a dedicated promo just for you. Use the coupon on the website to get 125% on your first four deposits. In all there are more than 10 codes you can use for ongoing deposit matches plus weekly specials. You can also find codes on the internet for free spins on slot titles such as Caesars Empire and Achilles. This represents a generous range of rewards and incentives, far wider than competing provider, Casino Midas, for example. At this point, the company does not offer a mobile app, meaning that it's only practical to play at the site on a desktop or laptop computer. Forward thinking brands are already catering to mobile users of iPad, iPhone and Android and this is something which the organizers of this brand should think about. 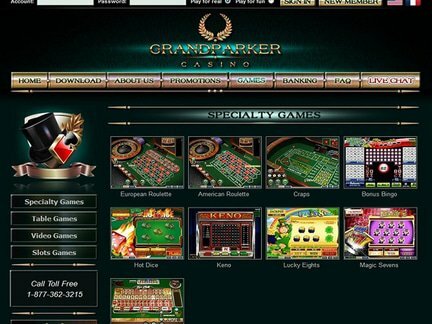 Gamblers in the United States are welcome to try their hands at Grand Parker casino and that fact alone has made it a highly popular venue attracting many North American members. France is the first European country with which the brand has gained major popularity. With over 100 slot titles to offer and one of the biggest ranges of Video Poker on the internet, everyone can find their own favorites on which to make use of a Grand Parker Casino Bonus. Achilles and Caesars Empire are probably the most popular slots at the moment due to the availability of free spins promos. Double Double Bonus Poker has become the firm favorite of Video Poker fans on the site and table gamers seem to prefer standard Blackjack over any of the other choices here. One big disappointment at this Realtime Gaming powered brand is that none of the big paying progressive slots are present. So if you plan to try and get lucky with a big jackpot using your no deposit voucher code, you're out of luck before you even start to play. Of course no progressive slots means there are no huge jackpots to report. The only winners displayed on the site are the names of people who have won prizes in competition play rather than jackpot winners. That doesn't mean there haven't been big winners here though. In February, Carey Stoneridge from Sarasota, Florida won just over $23,500 playing the Dream Run slot. This is her second big win on the site. She netted $12,000 playing at the site last year. Deborah Morin, from Scottsdale, Arizona was playing $2 bets on White Rhino when she hit a $5,500 dollar jackpot in February. Morin actually won this jackpot while playing with the chips she got free using a first deposit bonus. It's at this point that things get a little more disappointing. There is an absolute raft of complaints, many still unresolved due to a lack of response from the provider. These complaints relate mostly to long delays on withdrawals and withdrawals not being processed at all. Other complaints are regarding the company refusing to pay-out on winnings from no deposit and free spins coupon users, despite wagering requirements having been met. This is an alarming trend, although on balance it should also be noted there are a lot of good reports about Grand Parker Casino. This brand gets just 2 out of 5 for complaints and handling. With all the complaints floating around, it should come as no surprise that Milore Limited Casinos, who own this online establishment, licensed it in Curacao for its launch in 2012. Why they would choose to be licensed under Netherlands Antilles jurisdiction is something of a mystery, when European licensing authorities are known for far more stringent administration. 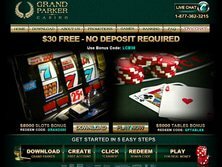 We reviewed Grand Parker Casino thoroughly, using all the available no deposit, free spins and deposit match incentives. Registration was straightforward, as was application of codes. Playing experience too, was satisfactory and there can certainly be no complaint about the game variety. However, the feel of the site is very bland and pedestrian. If you're not too bothered about classy design though, the Realtime Gaming software is as reliable as ever and the site is easy to navigate and functional. Obviously we were unable to test mobile playability on Android, iPad or iPhone, since there is no downloadable app for mobile users. We rate the site 4 out of 5 overall, purely because of the wide range of good quality games and general ease of use. Against that we felt that there are many better providers out there and for us, the whole experience was just OK. A lot depends on individual desire for a nice look and feel to a gaming venue. The sheer availability of incentives makes it a must play though, since personal risk can be kept to a minimum.